Goblins tend to have a reputation of being fairly unpleasant creatures but as we don’t know any it’s difficult to justify that accusation. They do appear to like gold though and that’s the subject of this classic slot from Microgaming. It’s called Goblin’s Gold and while it may only have three reels and three paylines it’s worth checking out even for those spoiled by much more sophisticated offerings. 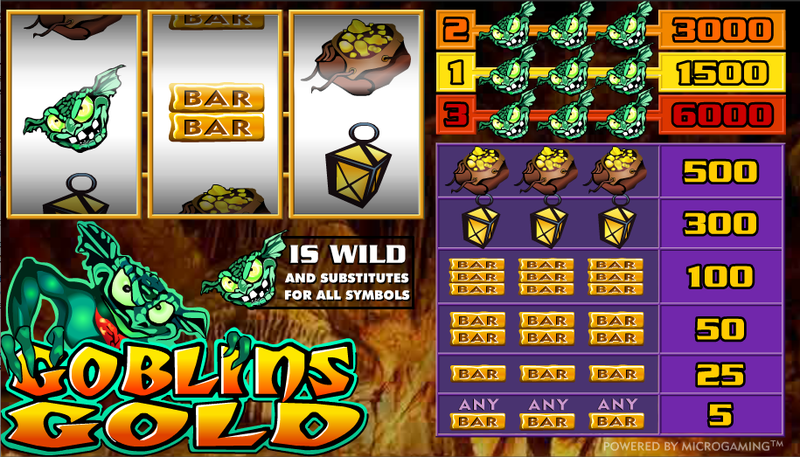 Goblin’s Gold plays out over three reels and up to three paylines and the green creature himself occupies the area underneath the reels. It’s fair to say he does look pretty menacing and perhaps he’s protecting the piles of gold which make up the background. All the paytable information you need is located on the goth hand side of the screen. There aren’t many symbols and they comprise single/double/triple gold bars, lanterns, bags of gold nuggets and then the goblin himself who’s worth the biggest prize of 6000x your line stake for three on payline number three – that’s the lower horizontal one. The goblin is also a wild and will substitute for all other symbols to help create winning combos. When you’re ready to get started you can use the ‘+’ and ‘-‘ buttons underneath the reels to set your initial stake of between £0.25 and £25.00. Now you can select up to three paylines to give a betting range of £0.25 to £75.00. The paylines are selected in order so to activate payline three for example you will have to have one and two active. This is important because the jackpot prize is on payline three. Economically it makes sense to play with all paylines because although your stake increases by 3x, the potential prize on offer increases by 4x. This is one of Microgaming’s older slots and it shows a bit it does have a certain charm and it also has authentic casino sound effects to accompany your gameplay. Why not try to take a bit of gold from the goblin?